We are Bob and Michelle, retired full-time RVers, traveling and enjoying as much of the USA as possible. We spend winters in Florida and the rest of the year traveling and working our way around the country. 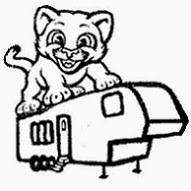 We travel in our Keystone Cougar High Country Fifth Wheel, thus the name and the stamp. We enjoy Geocaching, Waymarking, and Letterboxing. We're even giving Munzee a try. Whenever we stop, we use all four to help us learn about the area and find interesting sights and fun adventures. We also own an ever increasing collection of travel bugs that we launch and follow over time. We are new to Letterboxing and it seemed that a Personal Traveler letterbox would fit our lifestyle and let us meet and greet other Letterboxers as we travel. However we soon had a dilemma. If we post it as a Personal Traveler letterbox, we can't tell you where it is. If we post it as a Traditional letterbox, we can't require you to find us and answer a question. We got a lot of responses to our query about this on the AQ bulletin boards. Opinions skewed toward Traditional but not unanimous, so we decided to invent our own. This will be a "Traditional Personal Traveler". On Atlas Quest, it is listed as a Traveler. The box name is followthecougar. It is Atlas Quest Box AQ244271. The clue links here to our travel blog where we publish our current location along with stories of our adventures. We are at home working on plans for our summer travel. The box is inactive until we hit the road beginning 01 May 2017. This year we will follow the Mississippi River from New Orleans to Lake Itasca, MN. We plan to spend one week at each stop. The box will be available at every stop. We will keep this clue current as we travel. WHAT DO YOU NEED TO TELL US TO GET OUR STAMP? If you are nearby, stop in. We can chat a bit, share some refreshments, and we'll be happy to stamp your logbook.